Our friends at KeenGamer interview Monika and Nelson from the Legends of Callasia team about our ongoing Kickstarter and Greenlight campaigns (which was successfully greenlit in just 2 weeks, by the way)! Today’s interview with Monika and Nelson, part of the Boomzap Entertainment team about strategic game Legends of Callasia, beeing released in 2016. An epic strategy game of world conquest with simultaneous turn-based multiplayer gameplay and no hotseat waiting. Right now on KickStarter. We have asked Monika and Nelson few questions about the game, studio, plans and all the stuff behind the project. So here we go! Monika, you’re responsible for marketing and PR of your studio, am I right? Monika: Yes, I handle marketing and PR for Boomzap, which means I’m in charge of promoting the games and talking to press such as Keen Gamer. I also interact with our players online, and share feedback with the team. Nelson is the game designer of Legends of Callasia, who is also a Filipino like me. Nelson: My name is Nelson, and I design and test for Legends of Callasia, a simultaneous turn-based multiplayer strategy game. A lot of that design is actual scripting, which is much like simple programming, to make the game operate in the way we intend. For those, who haven’t heard about your studio before, please share some stuff with us. Where are you from, when was your studio founded, how many members does your team have, are you all settled in one/more country/ies and other things you would like to share with us about your team. Monika: Our studio was created in 2005 by our founders Christopher Natsuume and Allan Simonsen. Chris is our Creative Director, a Texas native now residing in Japan, while Allan is our Technical Director, a Norwegian living in Singapore. We have always been a virtual studio, and since then our company has grown to 30 developers working remotely from over 20 cities in 10 countries, including Indonesia, Malaysia, Philippines, Russia, Thailand, Ukraine, and Vietnam. 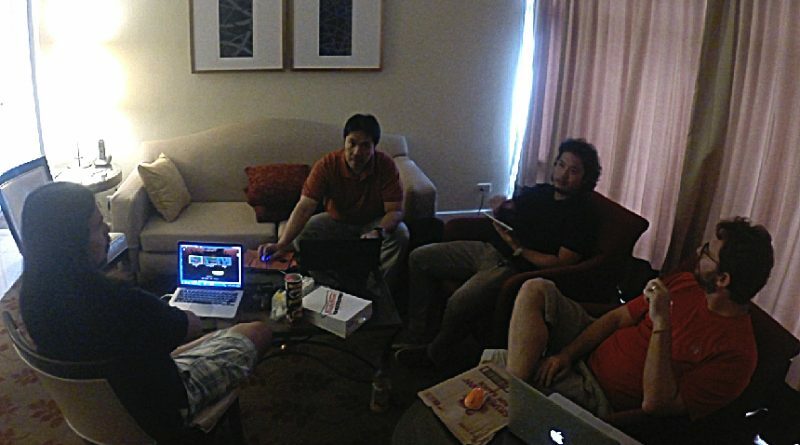 We do meet up from time to time to work together, as well as during local game conventions or when one of the founders pay a visit. One of the challenges of a virtual studio is we never, ever have a complete, team photo. You’re not a newbie on the market, how do you see Legends compared with other titles you have released? What do you expect from this one? Monika: We have been creating successful, award-winning hidden object franchises for quite a long time, which is definitely a different genre from Legends. We’ve also recently branched out to mobile free-to-play games such as Super Awesome Quest and Monster Roller, which has been challenging. Given this, we do have a talented, experienced team of developers that will surely deliver top-quality games. With Legends, we are going back to the same business model we’ve been using for our hidden object games: premium. If you’ll notice in the Legends of Callasia trailer, we’re proudly saying that it is not free-to-play. There are no ads, no in-app purchases, and it’s not pay to win. Players will only pay a fixed price once, and then they get to enjoy all the features of the complete game. Nelson: At the same time, Legends of Callasia is also the type of game we enjoy playing in our free time. Not that we didn’t enjoy our old casual games, but Legends has much more action, and the strategic aspect of the game gives some nail-biting experiences during multiplayer matches with friends. This leads me to a question about the Greenlight on Steam and ending KickStarter campaign. Right now the deadline is within 3 days and it seems like you won’t be able to reach the target. What will change if this would become true – not reaching the target? Will this affect the release date? Monika: Getting Greenlit in just two weeks is already a great accomplishment for us, and whether or not we make our Kickstarter goal, we’re still dedicated to releasing this game. We may not have the additional funding, but we’re not going to give up. During the open beta we’ve started building a community of players who are interested in this type of game, and we’re grateful for the feedback that would help us improve the game for final release. We don’t have a launch date yet, but we’re hoping it would be within the first quarter of 2016. About the game itself. When did you first come up with this idea? Nelson: Most of us are huge strategy gamers, while some are board game enthusiasts. For instance, Chris and Allan are both fans of grand strategy games such as Civilization, Crusader Kings, and Patrician. The idea to make our own came up a few years ago, and it actually started as a different game. We had been deep in the development of a trading simulation game where you sail ships across oceans and unlock new ports to trade with. But we just couldn’t make it as fun as we wanted – largely because of the lack of combat. We decided we wanted something different – we wanted heroes that can fight! So we redesigned from scratch, using a number of the tools we had originally developed for the trading game. We know that character art was one of our strengths – especially fantasy character art – so we used the same sort of illustrated style we had been using for years in our casual adventure games. What makes this game different compared to other strategy titles (starting with Heroes of M&M)? Nelson: Like Heroes of Might & Magic, Crusader Kings, Risk, and other world conquest games, Legends is a turn-based strategy game where you can form armies, command them across maps, and fight. What’s different is we’ve added a simultaneous planning and resolution cycle where all players make their turns at the same time, and see them resolved together. You don’t need to wait for another player to finish their turn, and it adds a strategic aspect of predicting what your enemies are up to in planning your moves. Legends of Callasia is a game that doesn’t take all day, and can be enjoyed for quick one-to-two-hour sessions. As one reviewer said, it’s like Civilization on speed! Will the game be released exclusively on Steam or also on Android and iOS? “Play everywhere” implies that you can play cross platform against others, will this be true? Monika: The original plan was to release on PC and Mac on Steam, and iPad and Android on the respective app stores. There has also been some requests for a Linux build, which we’re looking at right now. When you purchase the game, you are given your own account. Play everywhere exactly means that you can play on whichever platform you prefer. You can be on an iPad, battling a PC user, and so on. Your rankings will be saved to your profile and can be carried across your devices. Six players in multiplayer mode. Does it mean one against each other or some team deathmatches for example 3 vs 3? Nelson: It starts as one against all of them, but it’s up to you if you want to form alliances with other players and gang up against your enemies. In fact, alliances can be formed and broken throughout the game, so there’s plenty of opportunity for backstabbing! When talking again about KickStarter, what would you have done differently for a more successful campaign? Monika: To be honest, this is our second attempt at a KS campaign – our first one back in July 2015 was not successful. We changed a lot of things for our new Kickstarter: we renamed the game, released a demo, revised the video and story, started marketing early, and so on. This time we did get farther in the amount of pledges, and had a lot of press and youtubers checking out the game. To be honest, we had a lot of people mail us and say “how is this not taking off? 2 years ago this would have been Kickstarted in a few days!” It just seems that the opportunities for this kind of game – something that’s not a retro-pixel game, not made by a famous developer, not a sequel or reimagination of an old franchise, or doesn’t have some “hook” that gets it mainstream press simply is not going to be successful on Kickstarter, and we’ve come to accept that fact. On the good side, running a Kickstarter is free, so it’s not like we lost money on it. That being said, we’re looking at ways to take this game in its current state and continue to build the audience we do have and the press that we’ve received and make something from it. Steam Early Access, for instance, may be a better fit for what we’re doing – and we’re going to look into that next, assuming we can put that together.